One woman called Svetlana doubted it was a meteor claiming the UFO flew “parallel to the ground” and “vanished” in the air instead of falling. One man said: “It was incredibly stunning, really beautiful. “I don’t think I've ever seen anything as beautiful as this. Some residents said the meteorite was “blindingly bright, akin to the light and sparks created during intense welding work”. The space rock split into several parts before vanishing in the sky eastwards over the Irkutsk region of Siberia. It was visible for only around five seconds but its bright flash and booming noise meant it had many witnesses. "I pulled a phone out of my pocket, but it flew across the sky so fast that I only caught a long white trace it left,” said one woman. The local ministry of emergencies confirmed a meteor had been registered but said there was no threat to people or infrastructure, reported The Siberian Times. Expert Viktor Grokhovsky from Ural Federal University, said: “It exploded quite high in the sky somewhere over Irkutsk region. This was the third major extraterrestrial incident in four months over Siberia. Earlier, on December 18 a meteor exploded close to Russia’s Kamchatka peninsula north of Japan with a force ten times more powerful than the Hiroshima atomic bomb, according to NASA. 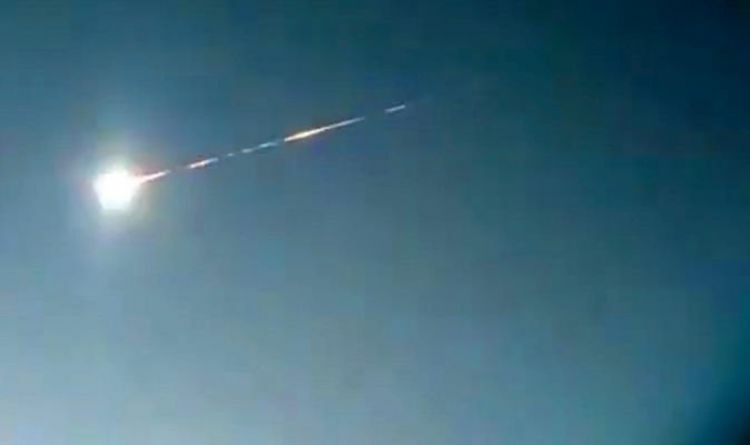 On March 15 a meteorite slammed into Krasnoyarsk region with local reports saying it ‘warmed the air’ and ‘shook the ground’ after streaking across the sky in a green, yellow and orange fireball. Part of this space rock is reported to have landed in the Podkamennaya Tunguska River smashing through 4ft of thick ice. A bid is to be made to lift the meteorite from the river bottom. The site is close to the world’s ‘largest known meteor explosion’ known as the Tunguska Event in 1911 which had the force of 185 Hiroshima bombs, wiping out 80 million trees. The March space rock is now known as the Tura or New Tunguska meteorite.